Working as an independent travel agent can be a rewarding and profitable experience, if you do it right. One of the biggest questions we hear from our agents is “how do we market ourselves?” This is a very important question, and there’s not a one-size-fits all answer. But for those of you just getting started, we’ve put together a list of the top things you should be doing to market yourself. Secure a custom, mobile-friendly website and social media handles and post often. Be personable and showcase why people should work with you; show off your personality and try to avoid being overly salesy in your content. Advertise your trips and why you’re the best person to work with for people to book said trips. Set yourself apart by specializing in areas or types of travel over others. Many people try to be a lot of things for everyone, but you’re more likely to be successful if you specialize in one area. 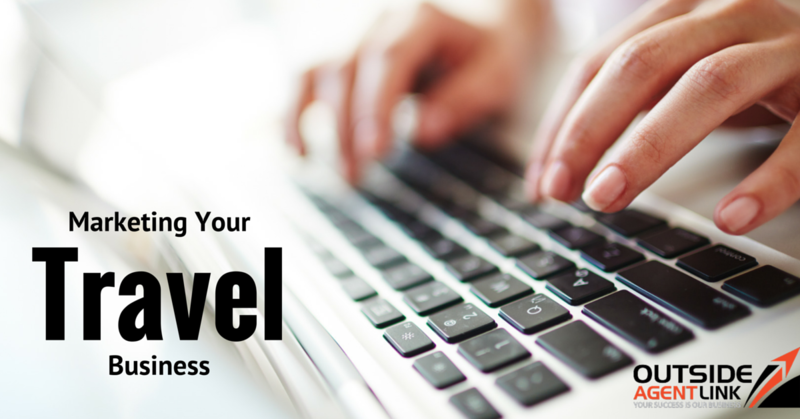 Blogging helps you appear as an expert and offers compelling content to potential clients. It’s important for you to set goals and benchmarks and measure your success so you can continue to improve as you learn what works and what doesn’t. Meeting new people is key to growing your network. Develop relationships with your clients and encourage them to refer you to their friends. Spread the word about your services and expertise by applying to guest blog for local magazines, newspapers, or online publications. You never know where you’ll meet a potential client. Develop a perfect pitch that you can deliver when people ask you about yourself and your business. Memorize it and repeat it often so that it feels natural and you don’t forget anything when you need to use it in real life. Be available on your phone, on social media, and by email when potential clients need you. The more responsive you are when people are still in the research phase, the more they’ll trust that you’ll be there for them during and after their trip. Find relevant organizations and influencers to partner with and build relationships with. Join professional organizations, the BBB, and other opportunities. The industry is constantly changing, and you need to be amenable to that change. Grow, diversify, and never stop doing research to make sure you’re learning best practices and adapting to new technology and ways of doing business.